INTEGRITY 3...People you know, service you can depend on. 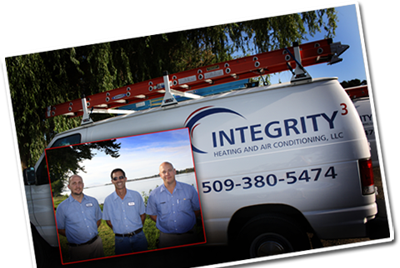 Integrity 3 Heating and Air Conditioning, LLC is a Tri-Cities based residential and commercial HVAC company founded by three local service technicians with a combined 35 years of field experience. You can be assured with Integrity 3 that your heating and air conditioning needs will be addressed by a knowledgeable technician. Skilled in a wide range of equipment – from small apartment air conditioners to large commercial and industrial facilities – our specialists strive to provide excellent service. Our number one priority is to provide customers with the quality service they deserve in a friendly, timely and affordable manner. Integrity 3 is available 24/7 to meet – or exceed – your expectations with honesty, reliability and significant value. We stand behind our work and strive diligently to meet your needs. Your satisfaction is a priority! Our company offers on-site inspections to detect potential problems. Regularly scheduled maintenance will ensure that your heating and cooling equipment is operating at peak efficiency.